Temunot and Stuff | A picture’s worth a thousand blogs. A picture’s worth a thousand blogs. It’s been a while since I posted, though I continue to get between 300-500 hits a day based upon The Great Puppy Experiment. 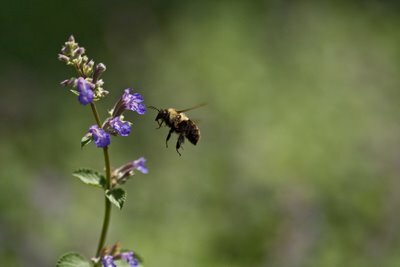 and is called Hovering Bee. You can see the original post here and all of Brooklyn Wolf’s pictures here. If a tree grows in Brooklyn (or whereverer else you are), bless it! Originally posted March 21, 2007. One of my daughters is currently in Washington, D.C. on her senior trip. Whenever I think of Washington,D. C., I think of its gorgeous cherry blossoms which I have only had the opportunity to see in person once. 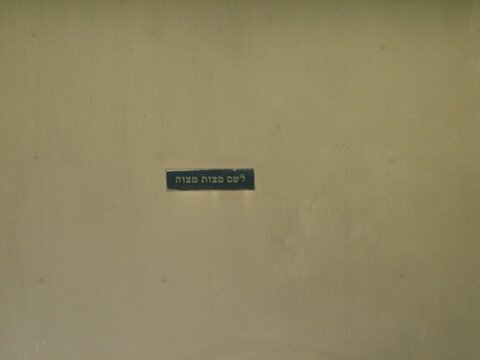 That would be a great place to say Birkhas HaIlan, the blessing over the trees that is included amongst the mitzvos of Nissan. 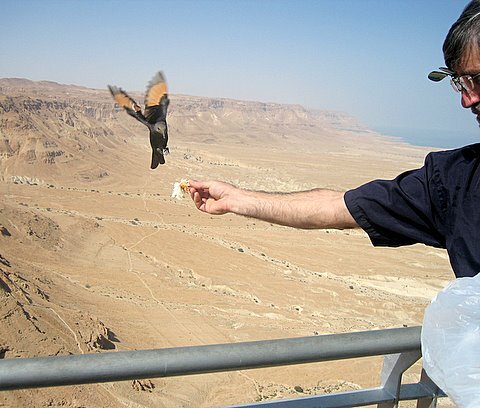 Last year I wrote Nothing Missing in His World with a few insights on this once a year blessing at Beyond Teshuva. 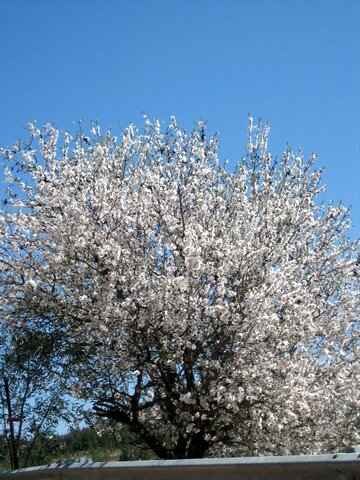 This is the only blossoming tree I have in my Israel collection from last year’s trip. 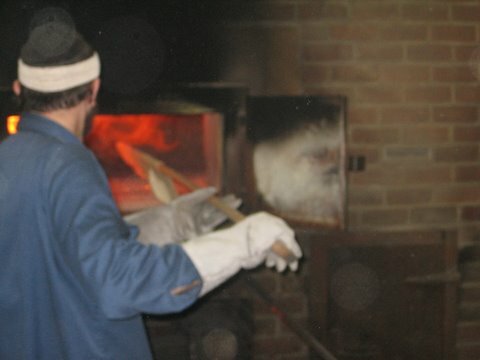 Here’s an amazing post at Heichal HaNegina on Birhas HaIlan and The Pittsburgher Rebbe’s famous niggun “Ilan, Ilan”. 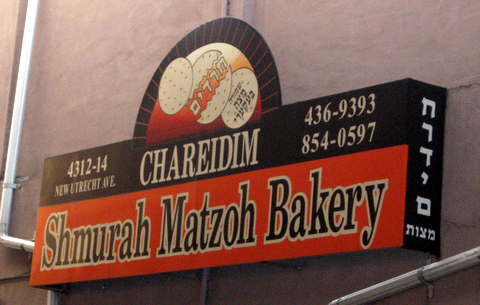 Last year, I posted some pictures from my visit to the Chareidim Shemurah Matzoh Bakery. 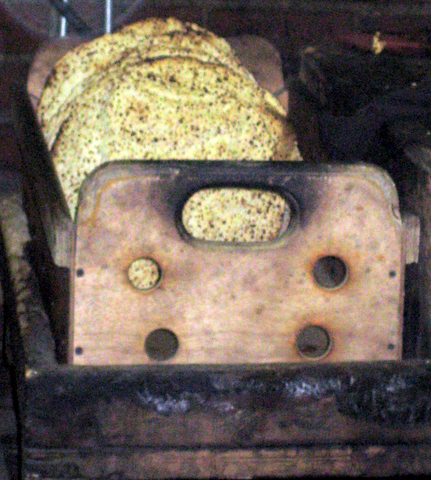 Through the rolling and flattening of the dough which I didn’t snap this year because there was a private chaburah working and I wasn’t sure that they wanted to be photographed. 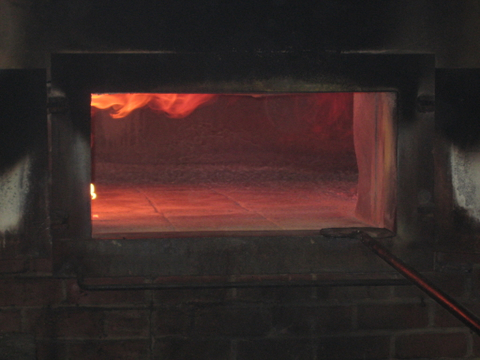 They were just putting some fresh wood into the oven when we got there. 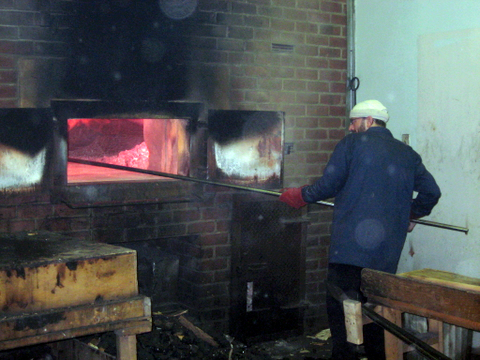 And we saw this guy quickly baking the mazah. 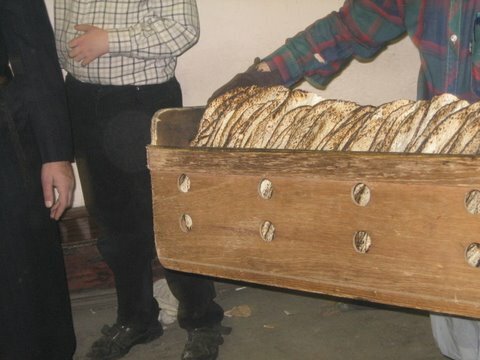 The matzah is then cooled and sent upstairs for boxing. Reposted from way back in 2007. 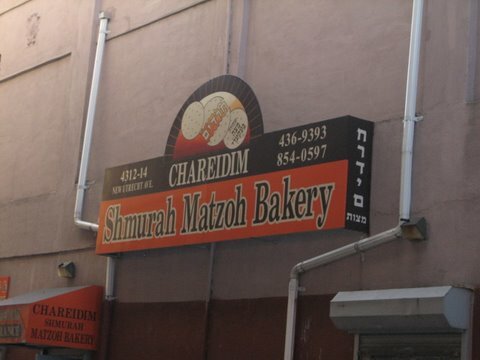 Yesterday, I paid a visit to the Charedim Shmurah Matzah Bakery in Boro Park. 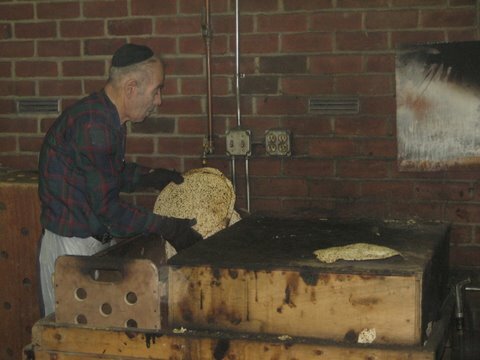 Charedim bakes the thinnest, crispiest shmura matzah you can find. 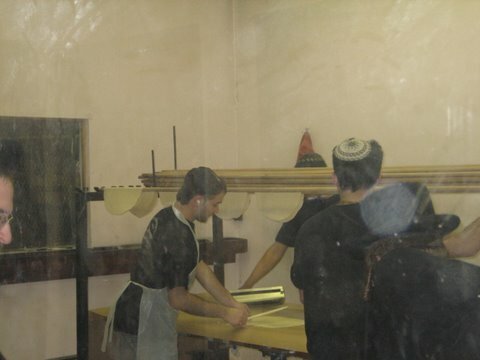 Of course, all of the matzah is made, at least according to the sign on the wall “L’shem Matzos Mitzvah”. 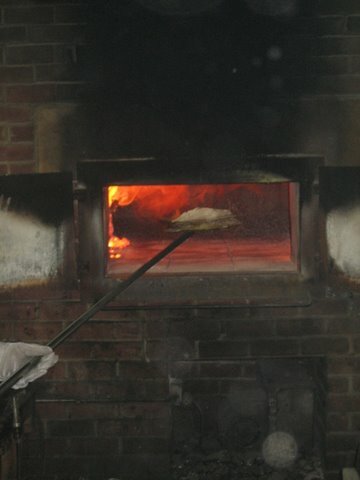 One guy was pounding the dough on a constant basis. Although he had been working over ten hours, he was smiling and happy to pose for a picture, even telling me to take it over since he was not in a good position on the first one. 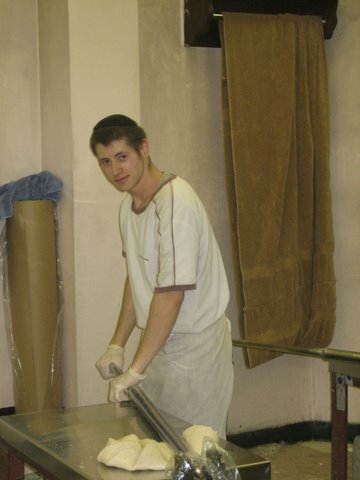 The matzah was then rolled out on tables until extremely flat (this pic is taken through plexiglass). My daughters got a kick out of the “coundtdown” where they count down the last ten seconds before the 18 minute period is completed and then everyone stops for the tables and utensils to be cleaned. 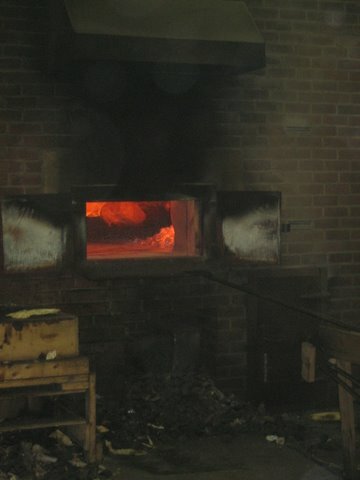 After the rolling, the matzah was then placed on rods and brought to a wood burning stove that was roaring with flames. he told me where to stand to take the best picture and counted down from three to one to the perfect point when to take this shot. 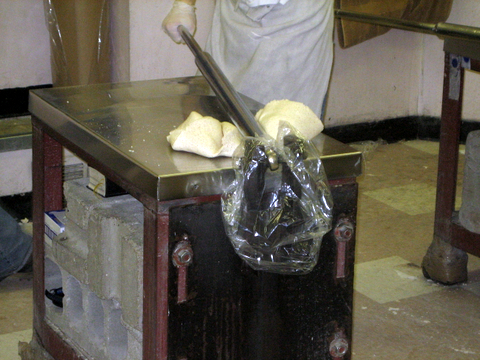 After they are baked, the matzahs are removed from the oven and placed in a bin where they are inspected and packaged. 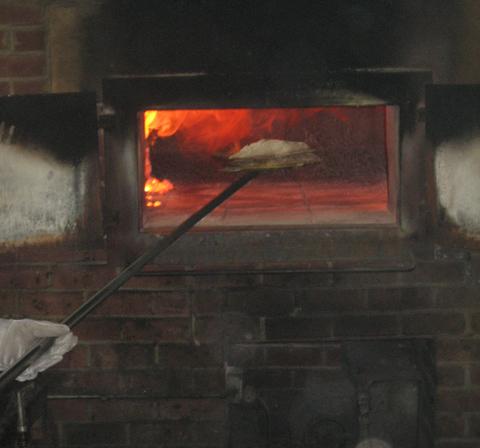 We were also fortunate enough to see a gentlemen “taking challah” on a batch. Chag Kasher v’ Sameach, I will not be blogging over Chol HaMoed. Well, we finally did it! We’ve reached our goal of raising six thousand dollars for Chai Lifeline through our running of the ING Miami Half Marathon as members of Team Lifeline. Thanks and yasher koach to all of those who contributed. We are still, of course, accepting contributions. So,if you would like to help support Chai Lifeline and the tremendous work that it does, click over to our page here. Now that we’ve raised the funds, do we actually have to run the race? The ING Miami Half-Marathon is less than two weeks away and my wife and I are gearing up for our run as members of Team Lifeline. We have a fund raising goal of $6000.00 which we have until January 18th to raise. Right now, we are at $5,703.80, verrrrrrry close. We are looking for a few good tens, twenties, thirties, millions, whatever, to help us reach our goal. If you are looking to contribute please click over to our page here and do so. Thanks a million or a ten or whatever. Just thanks. 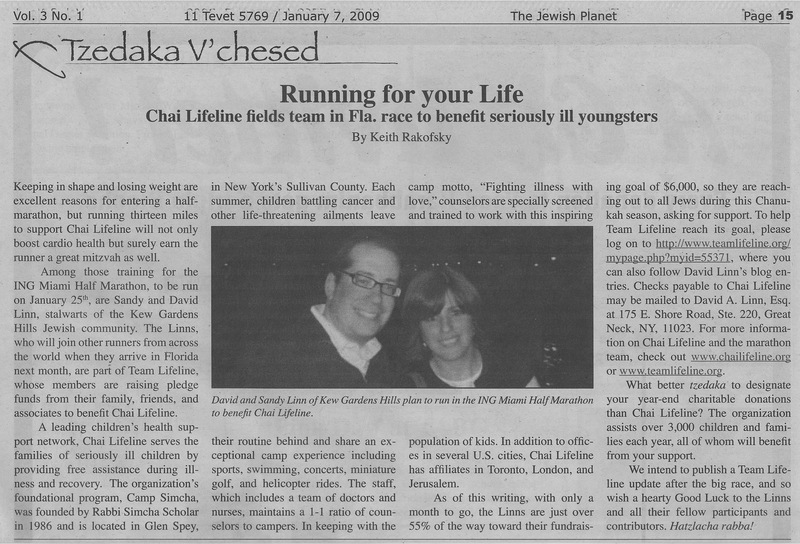 The Jewish Planet just published a story about our membership on Team Lifeline. Just for the record, I’ve lost about 10 pounds since that picture! Please help us reach our fund raising goal by contributing to Chai Lifeline at our website today. Thanks.